We are renowned manufacturer and supplier of Gujarati Kadhi Masala that is used in Gujarati Kadhi to add a rich taste and flavor. Offered masala is processed at our well established processing unit under the guidance of skilled professionals. 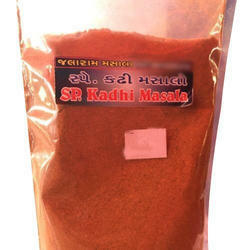 The provided masala is acknowledged for its purity, pungent taste and long shelf life. - Blend curd, gram flour, turmeric powder and salt in a blender until it is creamy and smooth. Manufacturer and exporter of Kadhi Masala which is made up of quality raw material.Gram masala provide by us is of realible price.